Federal regulators are giving their seal of approval to Metro's expedited timeline to add safety barriers to its 7000-series trains, assuaging fears from the transit agency that federal funding could be withheld from Metro's coffers. Metro said the manufacturer, Kawasaki, will install the new safety barriers on hundreds of the stainless-steel rail cars in May 2019. Even though that misses the Federal Transit Administration's original deadline by five months, officials with the agency said in a letter this week they will not penalize Metro for the delay — as long as it sticks to the May timeline. 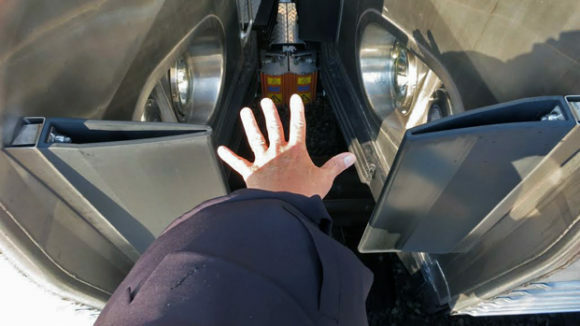 The new cars have come under scrutiny in recent years after at least two passengers with visual impairments mistook the gap between train cars for the doorway, stepped off the platform and fell onto the tracks. The Federal Transit Administration has instructed Metro that it must retrofit the new cars with extra safety barriers similar to those that appear on older trains — steel chains that stretch from the end of one train car to the adjacent train car, blocking people from walking into the gap between the cars. The FTA said it believes the barriers that originally were installed on the new trains, which look like two black rubber tail fins sticking out from the edge of each train car, are inadequate and unsafe. But when the FTA demanded that Metro install new barriers by the end of 2018, Metro passed along word from Kawasaki that it was struggling to find suppliers to manufacture the chain barriers and said it would be impossible to meet the deadline. Kawasaki forecast that it would take until November 2019 to finish the job. If the Washington Metropolitan Area Transit Authority missed the deadline, the federal government would have the power to enforce a penalty and withhold hundreds of thousands of dollars from the cash-strapped agency. Metro officials also feared the FTA could force them to take most of the fleet of 7000-series trains out of service — a prospect that would result in a calamitous cutback in Metro service. But federal officials later said they weren't considering such action. Two months ago, Kawasaki said it found a way to retrofit trains by May. The FTA says that timeline is acceptable, as long as no more new trains go into service without the extra barriers. "Although WMATA’s May 2019 commitment is later than the deadline stated in FTA’s June 2018 letter, given the additions to WMATA’s ongoing mitigation efforts, the nature of the supply and manufacturing constraints, and WMATA’s commitment that no new 7000-series cars will enter revenue service without the new chain [between-car barriers] installed, FTA accepts this updated work plan," wrote Henrika Buchanan, an acting associate administrator at the FTA. She said federal officials want monthly updates on the progress of the retrofits. They also want to see Metro continue to take precautions to warn riders about the risks posed by the 7000-series trains. In recent months, riders have noticed new, repetitive audio announcements on trains. Additionally, staff have placed high-visibility orange and white tape on existing rubber barriers to make them stand out to those with visual impairments. "FTA expects WMATA to continue efforts to educate and advise passengers and engage the disability community," the FTA letter said. FTA's compromise with Metro comes as it looks more likely that the federal agency will soon hand off its duties to oversee and regulate safety on Washington's subway system. The newly formed Metrorail Safety Commission board is expected to vote Monday to submit its application to FTA to become the official local organization responsible for monitoring Metro for safety problems and conducting inspections on the agency's infrastructure and operations. After that, there are multiple steps, as well as a lengthy transition period, before the Metrorail Safety Commission can take over for the federal government. The process was outlined in a recent memo from the Federal Transit Administration, which said that "the length of this transition period is not set and is highly dependent on factors such as [the Metrorail Safety Commission's] standards, staffing, and technical capacity."